Canada’s ultimate touring hockey festival, Rogers Hometown Hockey, is back for 2018 and will be rolling into Aurora on December 8th and 9th. 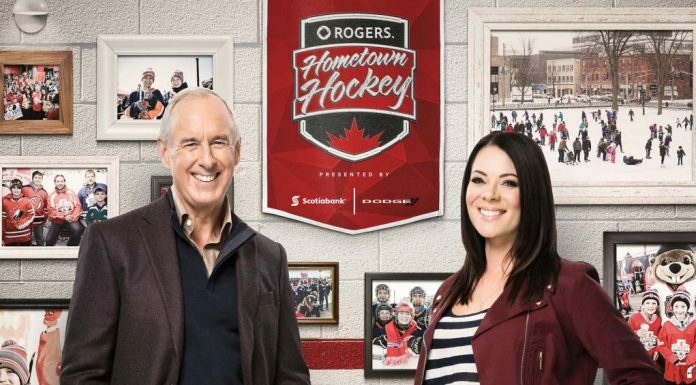 Aurora’s rich hockey culture will be featured on the weekly Sunday broadcast, which is shown nationally on Sportsnet with broadcasters Ron MacLean and Tara Slone, NHL alumni, live entertainment and hockey activities for the whole family. A highlight of the weekend will be a rousing Ontario Junior Hockey League (OJHL) matchup between northern York Region rivals, the Aurora Tigers and the Newmarket Hurricanes. The game will take place at the Aurora Community Centre on Saturday, December 8th at 7:30 p.m.
During the Aurora event, Rogers Hometown Hockey will air a doubleheader of NHL games on Sportsnet, on Sunday December 9th at 5:30 p.m., the Montreal Canadiens take on the Chicago Blackhawks, followed by the Calgary Flames and Edmonton Oilers at 9 p.m.
Oetker Giuseppe Pizzeria: Fans can enjoy a complimentary slice of Giuseppe Pizzeria pizza fresh out of the oven, and learn more about the Find Giuseppe contest with many great prizes to be won! Charity barbecue hosted by Aurora Minor Hockey Association, Central York Girls Hockey Association and York-Simcoe Express.